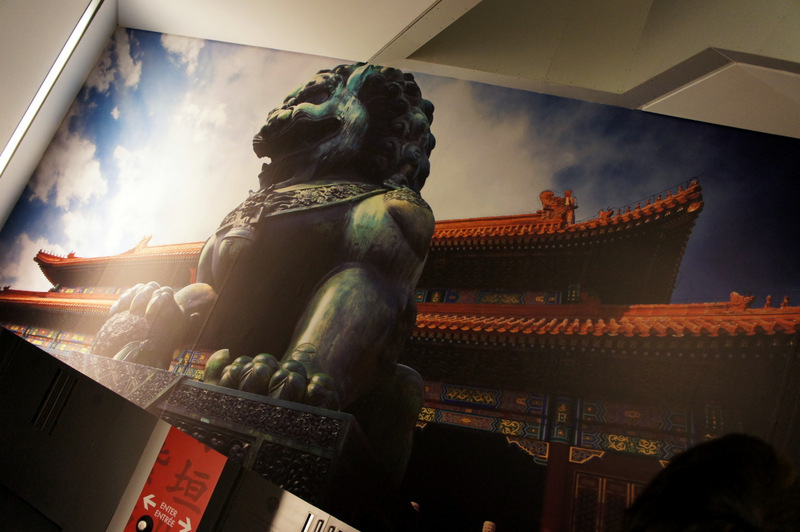 The Forbidden City has been revealed in the most unexpected of places. 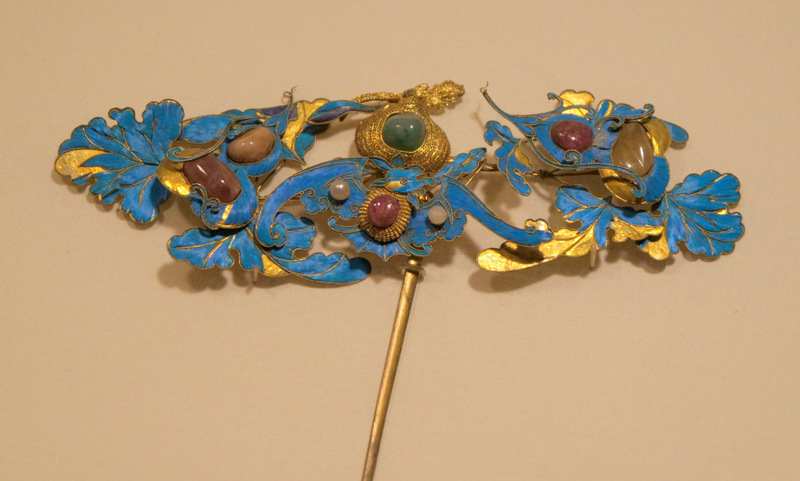 Treasured objects from inside the court of China’s emperors can now be found in downtown Toronto, courtesy of the Royal Ontario Museum’s latest exhibition. One can cross the central threshold of Bloor Street and enter into a world previously hidden from view, for anyone but the imperial family of China, their servants and trusted advisors. You, too are now entrusted to view the 250 treasures visible in Canada and in many cases, North America for the first time. 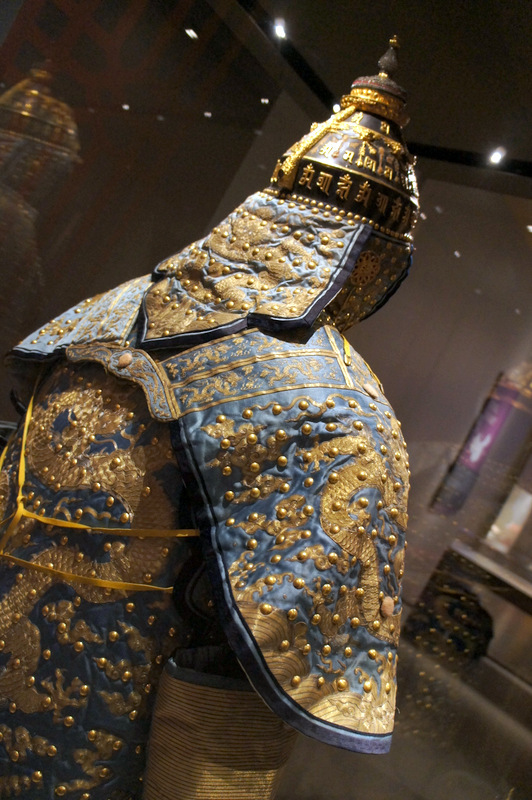 The ROM kicks off its Centennial celebrations by bringing to light (in many cases, quite literally) 500 years worth of China’s imperial past out of the vaults, in collaboration with Beijing’s Palace Museum. 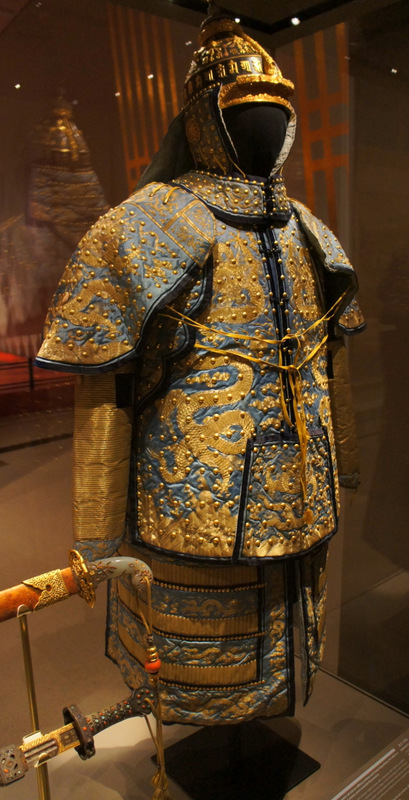 In fact, over 80 of the textiles, armour, calligraphy and more have never actually been outside of the Forbidden City, before now. 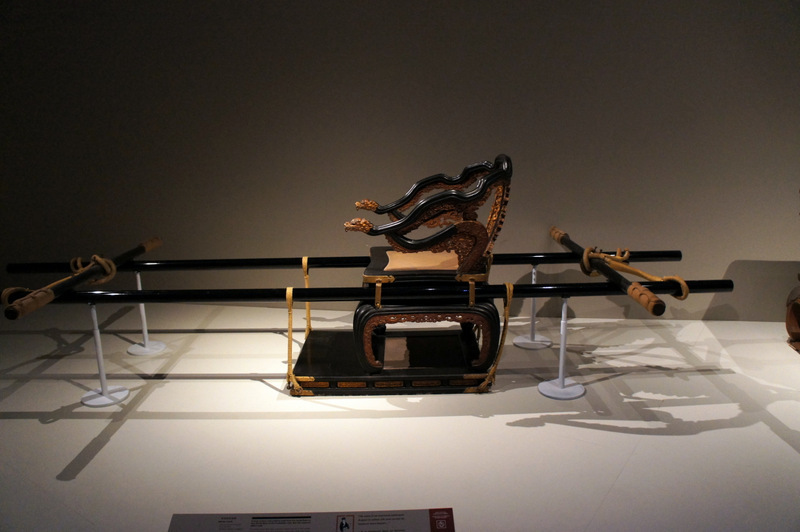 Imperial throne set, Qing dynasty, Qianlong period. 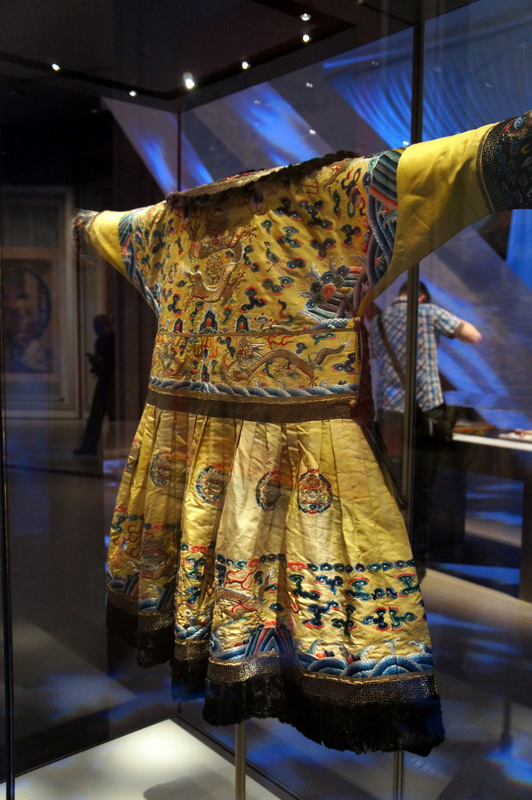 Child emperor’s ceremonial robe, Qing dynasty, Tongzhi period. 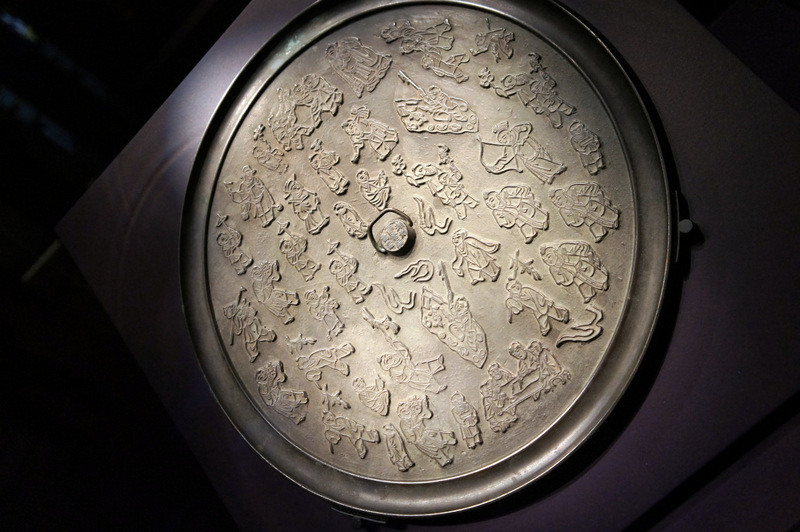 As such, many of the objects are light-sensitive and will be rotated throughout the exhibition. 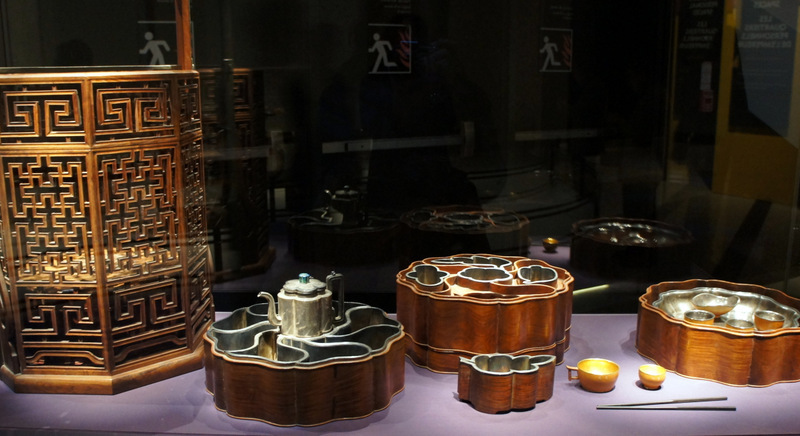 Carving out some quality time, Qianlong period. While some of these may be referred to as everyday objects, there is nothing ordinary about them. 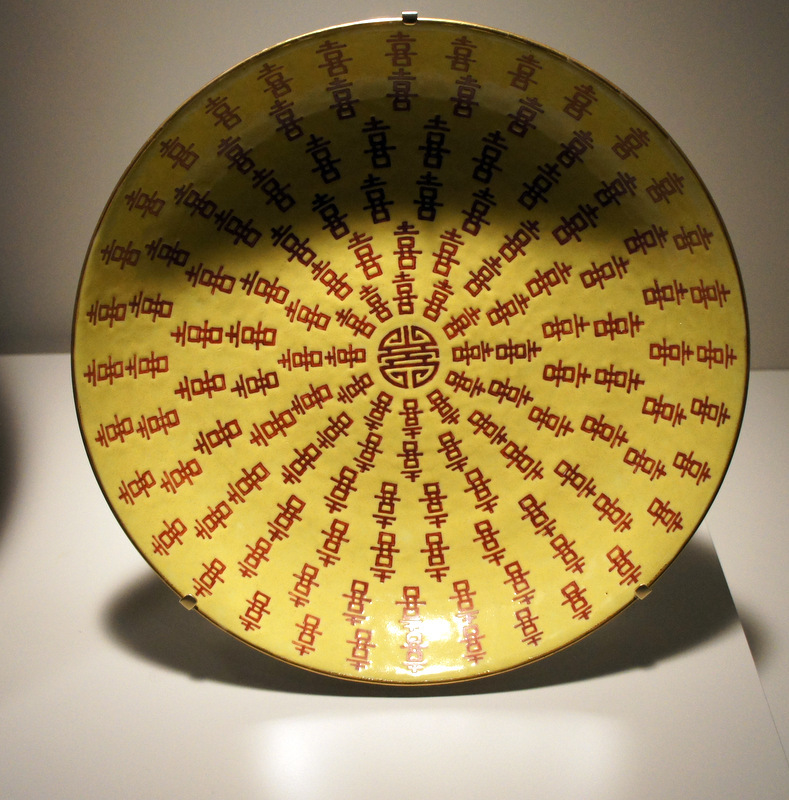 Yellow – a colour reserved only for the inhabitants of the Forbidden City. There is opulence at every turn and in every silken tuck. Each object tells the story of a mystical existence. One can’t help but envision the grassy path upon which the Emperor’s carriage travelled, nor the picnic feast laid out by servants alongside a running creek. Can’t you hear the water flowing over the rocks now? I can. The shape of the cups within the tea set are surely a nod to the natural surroundings they were used in. 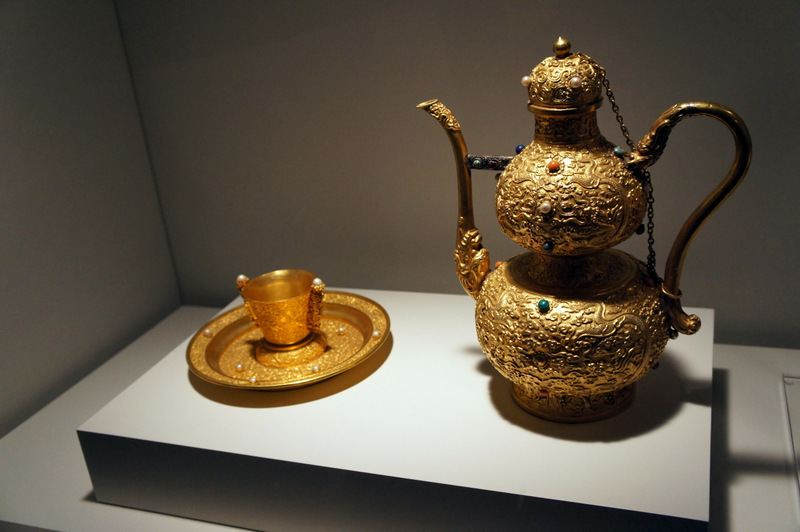 We use the word luxury so loosely in present day, but these emperors were bespoken for centuries ago. 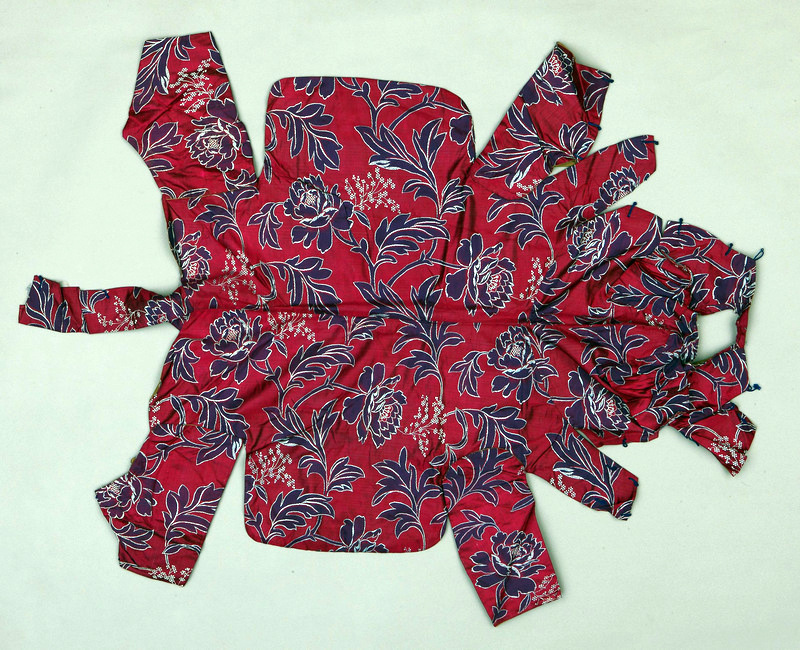 Each textile weaves within it the weight of importance – imperial importance. I am guessing they carry actual weight, as well. It’s miraculous to me that these fabrics have lasted the length of time that they have. 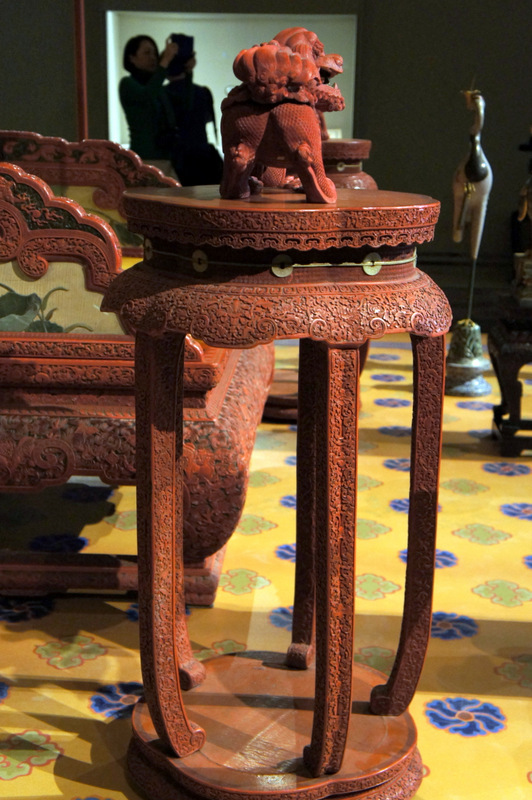 It speaks to both the laborious effort involved in their making, but also in their preservation through the ages. ‘Oh this? Just a little summer ceremonial couture I threw on’, said the Empress. This is couture of the Courts. Each piece was constructed on its own to complement the whole and each element was likely made by a master in their own right; each flourish signifying the importance and stature of the shoulders it was to grace. 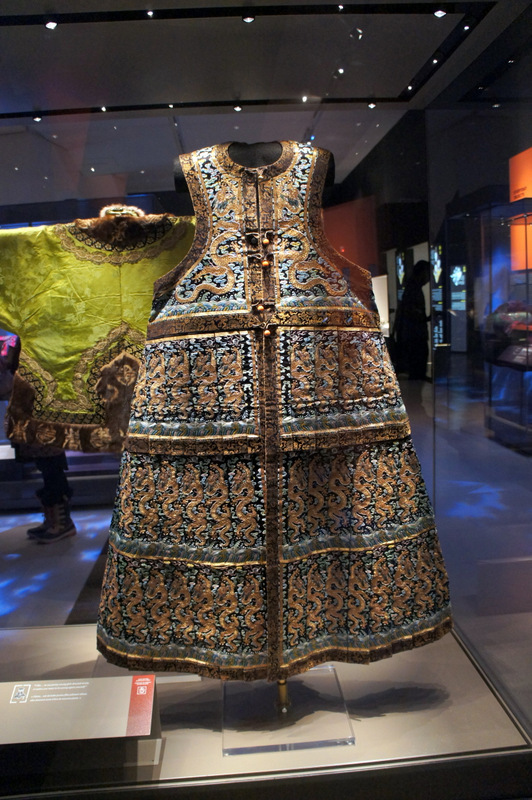 The Emperor’s old clothes. Sigh. Grace, too exists within these garments. 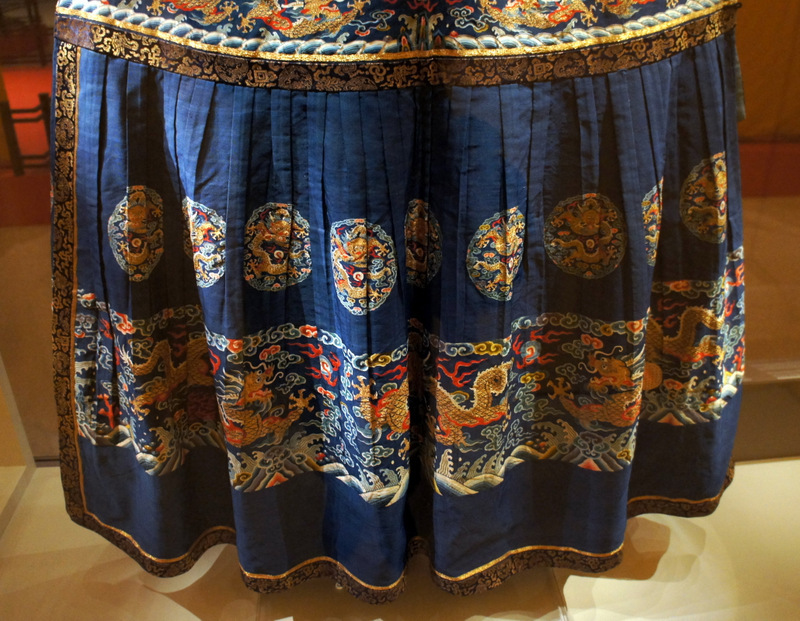 There is music within them – the skirt of a tunic sings like the plucked strings of a harp. The studs on the warrior garb gleam with sound…and fury. The Emperor’s dog was the Emperor’s dog, after all. 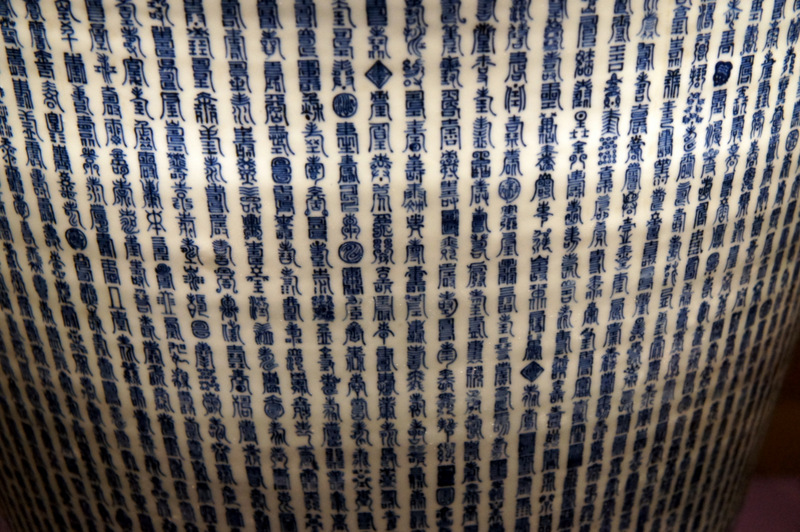 One thing that consistently emanates throughout the displays, whether on garments like the dog’s coat or in the carved throne or in the painstakingly painted characters in the ceramics – is Patience (with a capital P, please). There is a such a quiet and controlled hand at work in each and every object. Nothing is done without reason and nothing is just passable. Each detail is extraordinary. 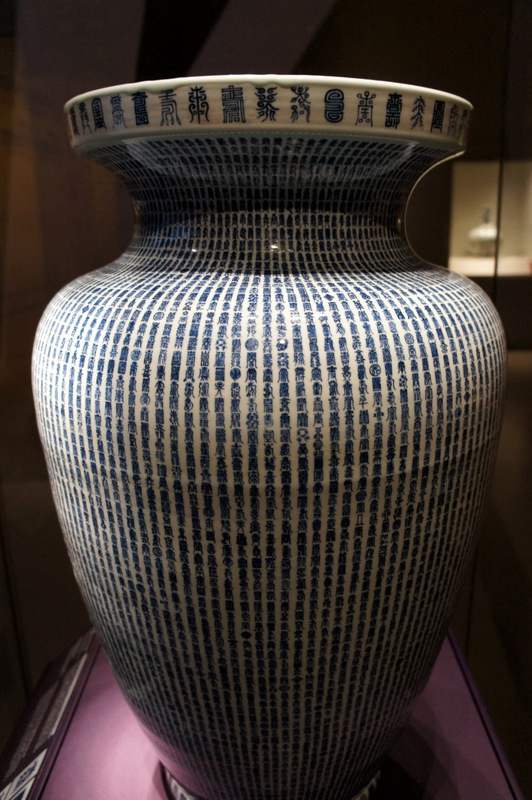 Jar with 10,000 shou characters. 10,000 characters. Painted by hand. One by one. It’s easy to just stroll through and look at the objects in a museum, but one must really stop and see them. One must really stop and listen to what they are saying. Look at the wider context, as well as at the details. These objects may not be from one’s own cultural past, but they tell us so many things about our world and how we came to be. In my initial stroll through, I could see Indian influence and perhaps hear Buddha’s footsteps in places; a nod to Persia in others. 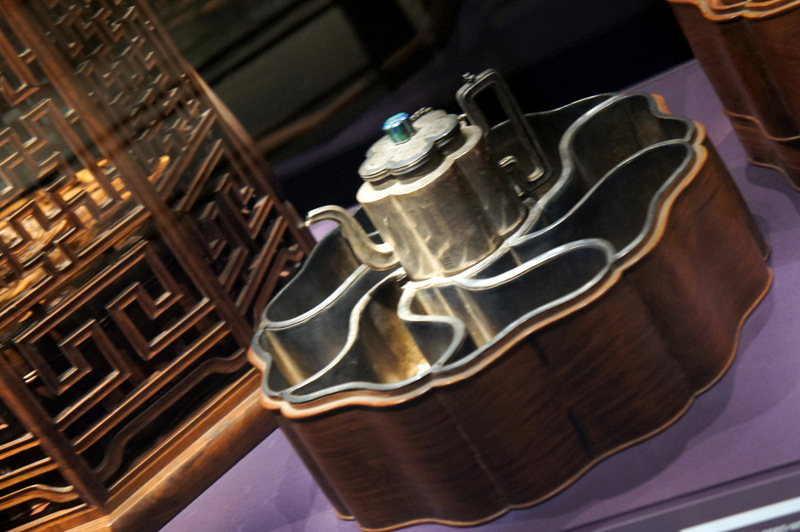 There is something about that tea box that Art Nouveau surely borrowed from. And the Victorians and Edwardians ornamented their hair as finely as the ladies of China’s royal courts. We’ve been let into a secret world, here. It’s worth getting lost in for a couple of hours, to travel back five centuries. All you have to do is walk through the Crystal and travel to China. 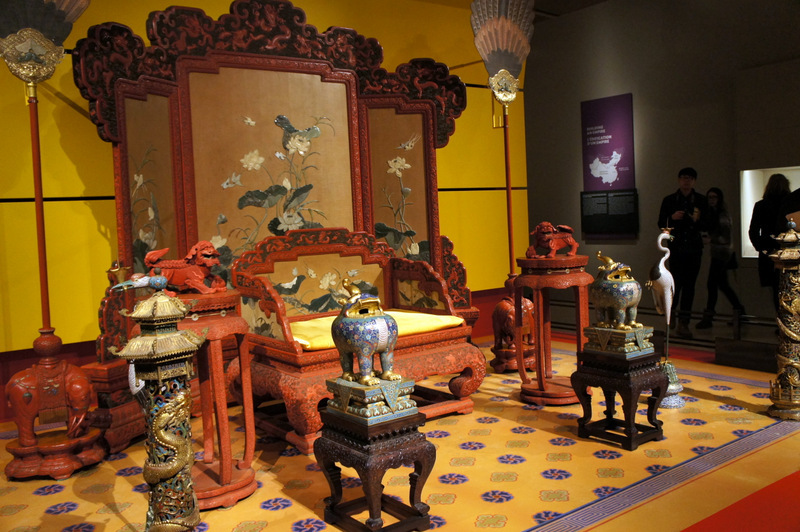 The ROM has a vast collection of Chinese artifacts, some of which augment this exhibition. 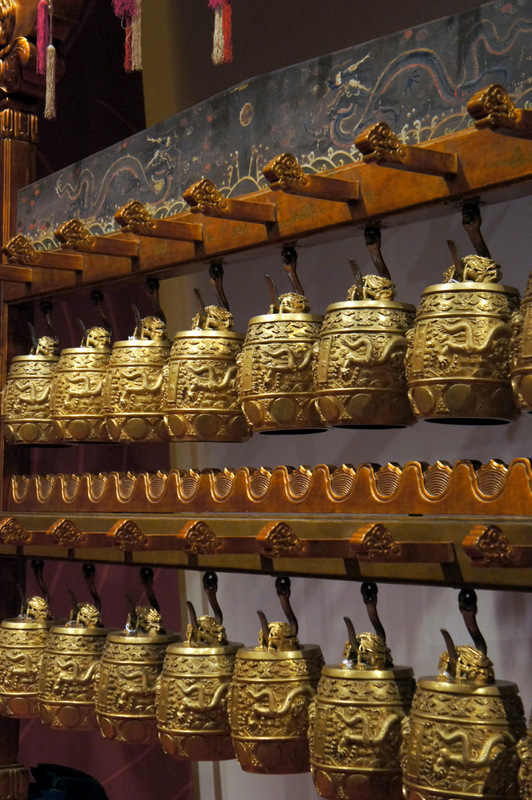 It’s worthwhile to drop by the Museum’s Gallery of Chinese Temple Art during your visit to get a wider context, or just to stand in awe in front of the murals that once lived on the walls of a Buddhist monastery in the 13th century. 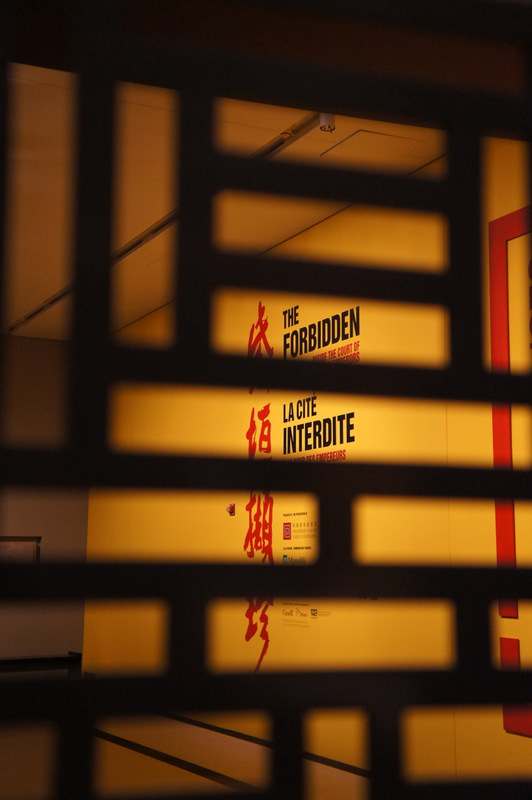 Forbidden City: Inside the Court of China’s Emperors will be on display at the ROM until September 1st. 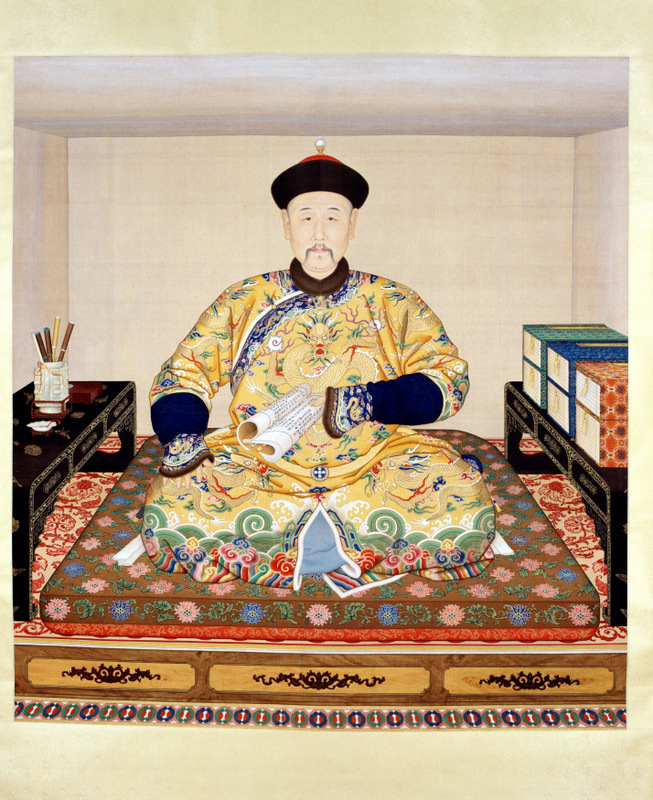 Portrait of Emperor Yongzheng in his study, Qing dynasty. 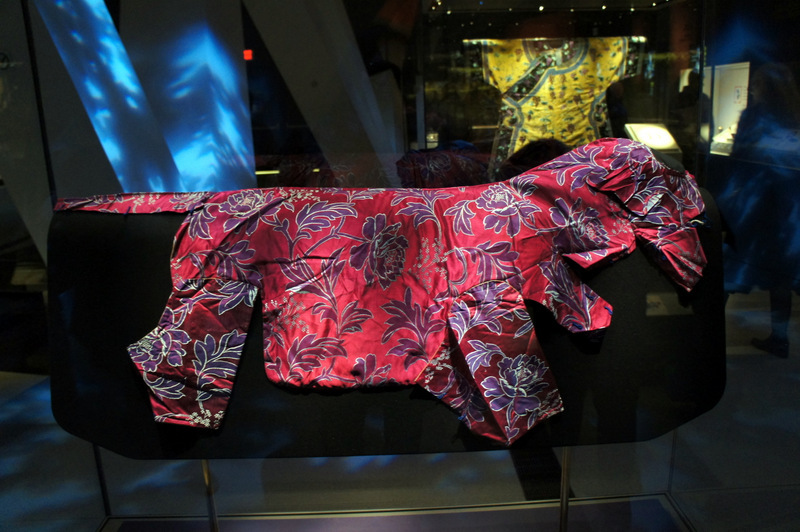 Images: Emperor's portrait and dog outfit pattern images are © The Palace Museum.